Fraternity membership jumped nearly 15 percent this year, to a total of about 1,273 members, after chapters wrapped up their fall rush Friday night. The fall pledge class totaled 15 more members than last year, with a net growth of 196 across fraternities, more than filling the spaces left by last year’s large graduating class, said Mateo Forero, vice president of recruitment for the Inter-Fraternity Council. Ten of the University’s 17 chapters now have more than 80 members, with four tallying more than 100 members. Chapters took an average of 18 new members – identical to last year’s average, but Forero said six chapters exceeded the average fall pledge class size. Forero said after rush, the IFC would begin seeing the effects of a new policy this fall that allows chapters to extend bids outside of the formal rush. He said there are about 115 men who did not join chapters but are registered on the IFC’s registration website, Interactive Collegiate Solutions. His chapter, Beta Theta Pi, plans to keep in touch with some. Delta Tau Delta had the largest pledge class this year, a total of 38 men. The chapter grew nearly 80 percent to 82 members. The University’s smaller chapters, including Sigma Alpha Epsilon and Kappa Alpha Order, saw the greatest percentage increases besides Delta Tau Delta. Sigma Alpha Epsilon more than doubled its four-member chapter and Kappa Alpha Order grew by 66 percent when it added 20 new members. 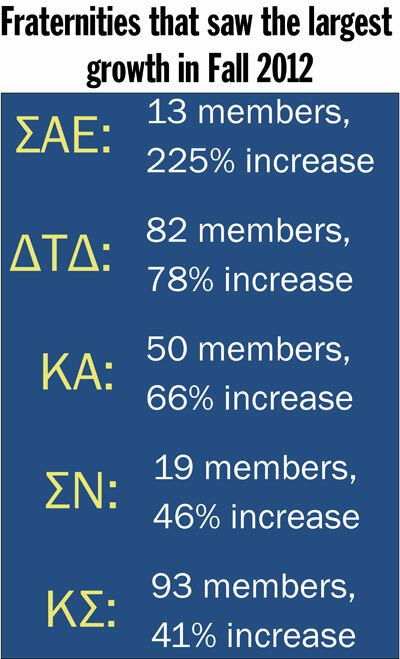 Forero said he saw not only numbers increase, but also the quality of the men who decided to join, which he credited to more intentional talks about the benefits of Greek life beyond its social scene. “Yeah, we’re social fraternities, we have fun, but there are other great things that we do and we’re able to show and lead by example,” Forero said. IFC President Dan Gil agreed, and chapters spent more time training members this year to talk about other parts of fraternity life. Christina Witkowicki, director of Greek life, said chapters tried to communicate all the “responsibilities of being a member of a fraternity” before students officially joined. “Our IFC fraternities have made a conscious effort in the recent past to tell their stories better,” Witkowicki said. The Hatchet incorrectly reported that the fall pledge class was 196 more members than last year. There were 15 more men in this pledge class than last year, and a net growth of 196.